Perfect home base for temporary needs: Well equipped & comfortable ! Make this comfortable Port Orchard house your home base while you take care of legal matters, visit family and friends, explore the Seattle area, go house hunting, or transition to a new job. The views from every room of this three bedroom house are enhanced by the beauty of nature, creating a sense of serenity: The Olympic Mountains, the water, a lush green belt in the private canyon behind the house and an expansive lawn and patio in front. The house is completely furnished and loaded with extras, including high-speed internet, HDTV. All utilities including sewer/water, waste management are provided at no extra cost. Children and well-behaved dogs are most welcome. The family style kitchen is fully equipped with pots and pans, dishes, flatware, toaster, coffee pot, microwave, stove, dishwasher, and a kitchen table for four with a view! The dining room table will accommodate six. China, candles, and stem-ware are available for special occasions. The living room is in the center of the house; it has a comfy leather sofa, recliner, and side chairs, plus an electric fireplace and HDTV. The master bedroom has a queen size bed. There is a double size bed with a walk-in closet in the second bedroom. The third has a twin size bed plus a desk so the room can also be used as an office. Wi-Fi is provided. The beds are freshly made, and towels are included for your convenience. Grocery stores, salons, gyms, restaurants, movie and live theaters and even a 24 hour Urgent Care are located with two miles of the house so you don’t have to go far for anything you might need. Mc Cormick Woods Golf Course, Trophy Lake Golf and Casting Club, and the Gold Mountain Golf Course are all within a six-mile radius. Enjoy a meal, entertainment, or wedding reception at the McCormick Woods Clubhouse Restaurant and Bar, or drive down the Port Orchard waterfront for dinner at the Light House or Amy’s on the Bay. Live theater at the Western Center for Fine Arts, located near the Marina is fun, as well as the local Farmer’s Market and Antique stores. Be sure to take a scenic ferry ride to Seattle for a day of shopping, Pike’s Market, and ride the monorail, to check out the view of Puget Sound from the Space Needle. Additional day trip destinations include the Olympic Rain Forest, Ocean Shores, Mt. Rainier or Mt St. Helen’s. The Kitsap Transit and the WA State Ferry System can take you on the scenic journey to The San Juan Islands, and British Columbia. TO RESERVE THE HOUSE, Enter your desired arrival and departure dates, touch the green button to the right for accurate pricing. Review the terms of the rental agreement. If acceptable, you may submit payment information and receive instant confirmation. Keywords: Rent by day, week or month. Affordable rates. Many extras: Cable TV, Wi-Fi, phone, water utilities, gardener, waste management, bed linens, towels, appliances, dishes cookware, laundry room. Port Orchard WA, near Bremerton & Seattle,..
After teaching for thirty four years and maintaining cars, airplanes and properties for even longer, we have retired to a life of creating 'home'(s)along the west coast and sharing with others. Our Port Orchard home is a keeper! When we are not working on a home, in a yard, or on the computer, we are enjoying grandchildren, traveling, reading,walking with friends or 'workng out' at the YMCA. We love the ambience, especially the fresh air, forests, clear skies and the natural beauty of the Puget Sound area. It is a great place to take a deep breath, relax,enjoy nature, and explore the wealth of outdoor activities. Being removed from the huslte and bustle of major cities, yet still having easy access to Seattle and other favorites like Gig Harbor, Silverspring, Tacoma, and British Columbia has been an important consideration for us. One chief advantage of staying here is the price: It is very inexpensive for what you get. Also, access to downtown Seattle via the ferry is simple, yet pleasurable with fantastic scenery along the way. Best of all the house is clean, comfortable, well equipped and very peaceful. One large bathroom. Bathtub has sliding glass doors and overhead shower. Seating for six at dining room table Seating for four at kitchen table. Beautiful view from both rooms. McCormick Woods and Trophy Mountain Golf Courses within 15 minute drive from house. Walking distance to waterfront. Be sure to check out the ferry system for a wonderful adventure throughout Puget Sound! House is within two blocks of Kitsap County Court House and Administrative Offices if you need to take care of business. The house was well located and quiet. There were no functional smoke detectors/fire alarms or fire extinguisher that we could find. Either the batteries were not in or they were dead. This worried us. There was a black mold smeared on the bathroom ceiling. For the safety of our guests, a fire extinquisher is kept in the laundry room. All batteries have been replaced and mold removed. The place was perfect! Everything we needed was there. It was nice and clean. It was nice having a local place when visiting family. This lovely, spacious house is well equipped with a great kitchen and large windows. We loved the quiet location close to downtown. Thanks for the wonderful review. We hope you can come back sometime. House as advertised, very clean and well stocked. Quiet neighborhood and very convenient to downtown and ferry shuttle. We will try to rent this house on future visits. Attractions: Clam digging, ferry hopping throughout Puget Sound; exploring the Olympic Rain Forest; playing golf or walking the many trails at McCormick Woods Golf Course; and, ferry rides to Pike's Market, Space Needle and shopping in Seattle are favorite activities. Favorite day trips include Mt St. Helens; Ocean Shores, British Columbia and Vancouver. 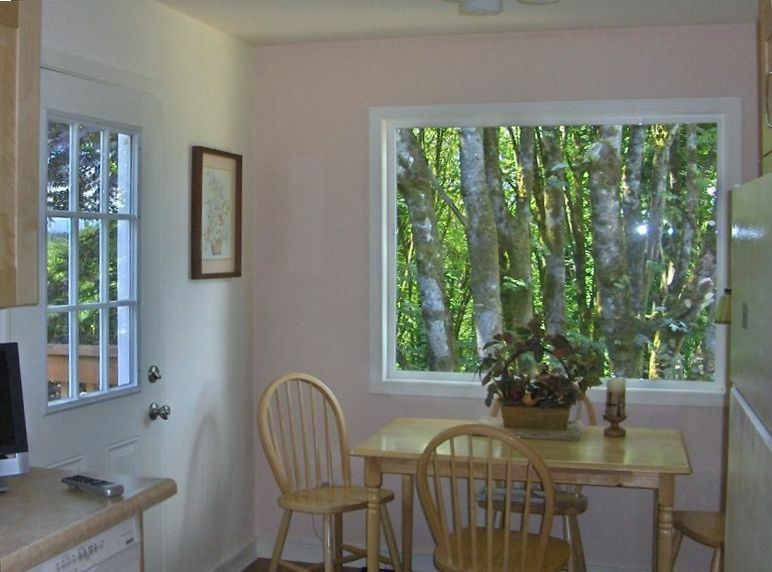 Location: This Port Orchard single-family house is just a short walk from the waterfront with live theater, fine dining, antiquing, and ferries to Bremerton and Seattle. Port Orchard is directly across the Sinclair Inlet from the Puget Sound Naval Shipyard at Bremerton; less than twenty miles from Bangor Naval Submarine Base; and, approximately thirty miles from Fort Lewis. SEATAC is about 35 miles away with convenient shuttle service to Port Orchard. The house is about an hour from Seattle by WA State Ferry System or freeway. Easy access to Seattle via ferry or freeway. E-checks are the preferred form of payment. (An efficient bank to bank transfer in a secure environment with no processing fee!) In case of necessity, a one time adjustment in Check In/Check Out dates may be possible, free of penalty.